To Cite: Motamedi H, Seyyednejad S M, Bakhtiari A, Vafaei M. Tagetes erecta, A Potential Medicinal Plant for Discovering a New Antibacterial Agent, Jentashapir J Health Res. 2015 ; 6(4):e29744. doi: 10.17795/jjhr-29744. Background: Tagetes genus contains 56 species and is native in North and South America, but some have become widespread around the world. Objectives: This study was designed to examine the antibacterial potential of methanolic and ethanolic extracts of Tagetes erecta. Materials and Methods: Hydroalcoholic extracts from aerial parts of this plant were prepared using aqueous solution of ethanol and methanol (8:2 v/v). The inhibitory effect of 1.5, 3, 6, 12 and 18 mg of effective dose per disc of these extracts was discovered against clinical bacterial isolates including three Gram-positive bacteria: Bacillus cereus, Staphylococcus aureus and S. epidermidis and five Gram-negative bacteria: Salmonella Typhi, Klebsiella pneumoniae, Escherichia coli, Pseudomonas aeruginosa and Proteus mirabilis. Minimum inhibitory concentration (MIC), minimum bactericidal concentration (MBC) and time kill kinetic assay of these extracts were also investigated. Scanning electron microscopy (SEM) analysis was performed to find possible structural changes following exposure to the extract. Results: Both extracts of T. erecta were active against B. cereus, S. aureus, S. epidermidis and S. Typhi. Hydroalcoholic extracts of T. erecta showed significant antibacterial effects against some clinically important pathogenic bacteria. These extract also caused deformation and lysis of bacterial cells, as shown by SEM. Conclusions: These extracts can be used as antibacterial agents in treating infectious diseases. Further studies are needed for considering this plant as an antibacterial plant and benefit from its clinical applications for routine use. Traditional medicine is the oldest method among populations which has used various parts of plants for curing diseases and infections. During the last five years, more than 13000 plants have been studied for their potential to be used in different traditional systems (1). Medicinal plants are useful and essential because they have active substances which are used in curing of many human diseases (2). Many compounds such as peptides, unsaturated long chain aldehydes, alkaloidal constituents, some essential oils, phenol and water, ethanol, chloroform, methanol and butanol soluble compounds have been identified in some medicinal plants in many studies (3). People around the world use plants for curing many diseases and infections which goes back long ago (4). Tagetes erecta is an herbaceous ornamental plant. This plant has a long history in traditional and folk medicine and has been used in many countries (5). This is a native species in Khouzestan province, Iran, which is easily available, but no reported study has been conducted on antibacterial properties of this native plant in this region. The aim of the present study was finding out about the antibacterial activity of this native plant in Khouzestan, Iran against some clinically important pathogens. With regard to the fact that active constituents of plants can be affected by climate conditions and considering the hot and humid climate of Khouzestan province, this study seemed to be necessary to find the antibacterial potential of this plant. The understudy plant was collected from Shahid Chamran University farmland in Khouzestan Province, Iran. The taxonomic identification and confirmation was performed by comparing the plant with the existing herbarium in the department of biology, Shahid Chamran University. The aerial parts of T. erecta were shade dried at room temperature for 10 days and ground to a fine powder using electronic blender. One gram of the obtained powder was extracted using 10 mL of alcohol (ethanol or methanol, Merck, Germany)-distilled water solution (8:2 v/v) and centrifugation (3000 rpm) for 15 minutes and then the supernatant was harvested. This process was repeated three times and the solvents were evaporated by placing at room temperature for seven days (6, 7). A total of eight bacterial strains were tested including three Gram-positives; Bacillus cereus, Staphylococcus aureus and S. epidermidis and five Gram-negatives; Salmonella Typhi, Klebsiella pneumoniae, Escherichia coli, Pseudomonas aeruginosa, and Proteus mirabilis. These species were originally isolated from clinical specimens and identified according to standard phenotypic and biochemical tests (8). The antibacterial activities of the ethanolic and methanolic extracts of T. erecta were surveyed by disc diffusion assay (9). Stock cultures of the test bacteria were grown in Muller Hinton Broth (MHB, Merck, Germany) medium at 37˚C for 22 hours. The final cell concentrations were adjusted to 1.5 × 108 CFU/mL with reference to the McFarland turbidimeter (10). A lawn culture was then prepared on Muller-Hinton Agar (MHA, Merck, Germany) using sterile cotton swab and allowed to remain in contact for one minute. Five effective doses including 1.5, 3, 6, 12 and 18 mg were prepared in each sterile filter paper disc (6 mm diameter) (11) and placed on the lawn cultures of bacteria. The plates were left at room temperature for one hour to allow the diffusion of the extracts from the discs into the medium and the petri dishes were subsequently incubated at 37˚C for 24 hours. The inhibition zone around each disc was measured (mm) and recorded. The most sensitive bacteria were selected based on the inhibition zones around discs containing the plant extract. Simultaneously, different standard antibiotic discs including nafcillin, carbenicillin, novobiocin, doxycycline, oxacillin, vancomycin, cefotaxime, tetracycline and penicillin were also used in the same manner for determining the antibiotic susceptibility of the isolates (9). The Minimum Inhibitory Concentrations (MICs) of the extracts were determined for the most sensitive bacterial species. For this purpose, macro-broth dilution assay was used. In this assay, bacterial suspension equal to 0.5 McFarland turbidity and different two-fold dilutions of each extract were added to tubes containing 1 mL MHB. These tubes were incubated at 37°C for 24 hours. The first tube in the above series with no sign of visible growth was considered as the MIC (12). This process was repeated three times. To determine the Minimum Bactericidal Concentration (MBC), for each set of test tubes in the MIC assay, a loopful of broth from the tubes with no visible growth was cultured on MHA and incubated at 37°C for 18 - 24 hours. The highest dilution that did not yield colony formation on MHA was considered as MBC (3). The time-kill kinetic was surveyed by culturing one standard loop of the suspension from the tube possessing MIC on MHA from 0 to 36 hours after incubation with the MIC concentration. This was performed at one-hour intervals for the first 18 hours and then at two-hour intervals for the later 18 hours (12). To find the possible effects of active substances in alcoholic extracts of T. erecta on structural integrity of the target bacteria, Scanning Electron Microscopy (SEM) analysis was designed. For this purpose, an antibacterial susceptibility test was performed with ethanolic extract against S. aureus with 15 mg of the effective dose. 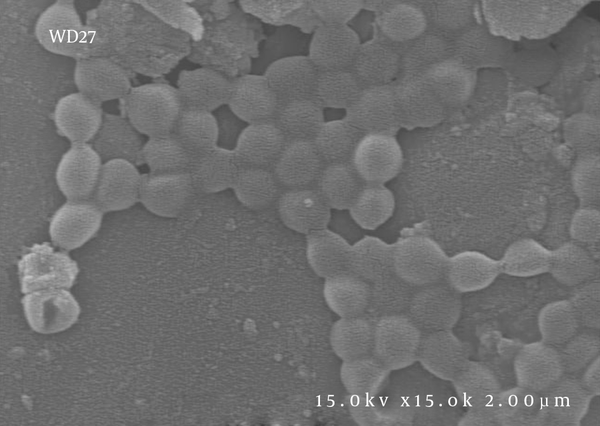 After 24 hours and appearance of inhibition zone around the disc, a sample was taken from the margin of the halo and after coating with Ag, it was analyzed with a Hitachi Japan S4160 electron microscope (13). The antibacterial activities of ethanolic and methanolic extracts of T. erecta resulted in a growth inhibition of the tested bacteria. The results of the antimicrobial activity are given in Tables 1 and 2. These results showed that these extracts were effective against four of the tested organisms including S. Typhi, S. epidermidis, B. cereus and S. aureus. The highest activity (inhibition zone of about 24 mm) was demonstrated by the ethanolic extract of T. erecta flowers against S. epidermidis, while the lowest activity (inhibition zone of about 7 mm) was demonstrated by the ethanolic extract against S. Typhi and the methanolic extract against B. cereus. On the other hand, the ethanolic and methanolic extracts were not active against P. aeruginosa, K. pneumoniae, P. mirabilis and E. coli. The MIC results of the ethanolic extract against S. epidermidis, S. Typhi and S. aureus were 10, 80 and 40 mg/mL, respectively, while MBC was found only against S. epidermidis as 40 mg/ mL. In the case of methanolic extract, the MIC indexes against S. epidermidis, S. aureus and B. cereus were 10, 40 and 80 mg/mL, respectively and the MBC index was found only for S. epidermidis as 80 mg/mL. The result of time-kill kinetic assay revealed that ethanolic extract was able to inhibit the bacterial growth after five hours of incubation which is a valuable finding with respect to rapid control of pathogens. In the SEM analysis (Figure 1), the affected bacteria were deformed and as marked in Figure 1, finally lysed due to the disturbance of cell wall integrity. a Abbreviation: NE, no effect. b Inhibition zone (mm, 6mm diameter disc). a Abbreviations: R, Resistance; -, not used. b Concentrations: CB, 100 μg; Cef, 30 μg; DX, 30 μg; NF, 1 μg; NB, 30 μg; OX, 1 μg; Pen, 10 μg; Tet, 30 μg; Van, 30 μg. The arrows show deformed or lysed bacteria. In various plants, antimicrobial activities have been reported in many investigators (14, 15). Plants are common sources of antimicrobial agents and 80% of the world population uses them in traditional medicine because of their few side effects (16). In this study, a variety of Gram-positive and Gram-negative bacteria were selected for investigating the antimicrobial effects of hydroalcoholic extracts of T. erecta flower. As resulted, the ethanolic and methanolic extracts of T. erecta showed varied ranges of antimicrobial activity against the tested organisms which is comparable to the effect of standard antibiotics. The studied bacteria showed resistance to the majority of standard antibiotics commonly used for treatment of infectious diseases, while they were inhibited by the extracts of T. erecta. This finding represents that the effective constituents of this plant have the potential to be used for formulation of new antibiotics for fighting against resistant species. The results of the present study revealed that the hydroalcoholic extracts from flowers of T. erecta possessed appreciable potentials of inhibiting the growth of S. typhi, S. epidermidis, B. cereus and S. aureus at 12 mg of effective doses. The results of the present study are in agreement with scientific investigations of Verma and Verma, who investigated the antibacterial effects of the ethanolic extract of T. erecta flower and found significant broad-spectrum antibacterial activity, especially against E. coli and B. circulans. (5). The results of Jain et al. study revealed that methanolic extract of T. erecta was effective against 10 different pathogenic species. Their result is in agreement with our data regarding the inhibition of S. typhi, B. cereus and S. aureus, while they reported the inhibition of E. coli and P. mirabilis, which is in contrast with our findings (17). Rhama and Madhavan extracted patulitrin from flowers of T. erecta L. which is a flavonoid and showed its antibacterial effects against different bacterial species including B. cereus, which is in agreement with our study. T. erecta flavonoid patulitrin is one of the potential elements for therapeutic uses (18). The antibacterial activity of the T. erecta can also be due to alkaloids, as Das and Mishra reported. They extracted this substance from T. erecta leaves, which was traditionally practiced in treatments of boils, dysentery, indigestion and various skin infections. They found broad-spectrum antibacterial activities from the identified alkaloids and suggested that the crude alkaloid can be used as a potential drug separately or in combination with other antibiotics (19). Kiranmai and Ibrahim evaluated the antibacterial potentials of different extracts of T. erecta. As a result, they reported that ethyl acetate extract of the flower of this plant can dose-dependently and significantly inhibit the growth of S. aureus and B. cereus, but not E. coli, which is in agreement with our results (20). Dasgupta et al. reported that the aqueous extract of T. erecta has antibacterial effects against airborne pathogenic bacteria as well as against skin infection-causing bacteria and suggested that it can be used as an antiseptic and also for skin infection control (21). Ramya et al. investigated the phytochemical composition and bacteriostatic activity of ethanolic extract of T. erecta. Their results showed high inhibitory effect of this extract against S. aureus, S. epidermidis and mild inhibitory effect on P. aeruginosa, which is in agreement with our findings (22). In the study of Gupta and Vasudeva, the antimicrobial effects of five extracts from the root of T. erecta were discovered. As a result, all the extracts exhibited significant antimicrobial activities against three Gram-positive and two Gram-negative bacterial species (23). The effects of active substances obtained from this plant on cell wall are advantageous, because there is no similar structure in eukaryotic cells, and hence, the least side effects are expected following using this plant. Furthermore, the antibacterial agents that have bactericidal properties are preferred due to elimination of the target bacterium and there will not be a risk of recurrent infection. In general, T. erecta is a significant antimicrobial plant which can be used in folk medicine and will be a potential source for finding new antimicrobial agents to cure and control infections caused by Gram-positive bacteria. The authors wish to thanks the Vice Chancellor for Research of Shahid Chamran University of Ahvaz for providing the research grant (No. 54314777).